The international IEEE workshop of e-Health Pervasive Wireless Applications and Services e-HPWAS'17 (in conjunction with the 13h IEEE WiMob conference) targets providing optimal, secured and context aware e-health services with the best quality of services (QoS) and users experience (QoE). Applications and services are considered in wireless environments and architecture with the use of IoT (Internet of things), big data analysis and a strong heterogeneity of the used access technologies, sensors, terminals, users needs and services (data, content, live streams or complex network services). Emerging e-Health services and applications can involve the use of heavy content such as multimedia content and streams (e.g. 3D-TV, media conferencing, remote live diagnostics) using conventional e-health equipments and devices but also using modern devices like smart TV sets, home-boxes, smartphones and tablets. The considered issues of e-HPWAS are related to e-Health care and safety services provided for patients, elderly and dependent persons. These services are generally built using different communication technologies, for different profiles of people and in different contexts and places (e.g. in health institutions, at home, in the city). Ideally, provided services should be accessible anytime, anywhere and using any kind of device or platform. 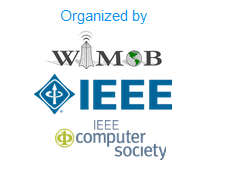 All accepted papers will be published in the 13h IEEE WiMob conference proceedings published by IEEE, and will be accessible via IEEE Xplore Digital Library and indexed by DBLP. The workshops will be held on October 9, 2017. All papers will be considered for the Best Paper Award. The workshop organizers will select a number of candidates for the award among accepted papers. The nominated and selected papers will be presented to eHealth TC Best Paper Awards.